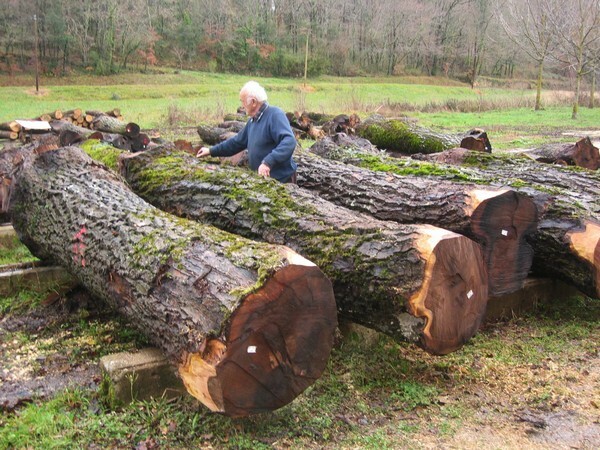 We usually buy walnut tree trunks from private landowners. The owner calls us in to sell his tree when the walnut is starting to die, or when the quality of the walnut crop produced is no longer of marketable quality. Firstly, the volume of the tree is calculated and an estimation of its price is given. Then the tree is “uprooted” by our forestry team. Why do we uproot the tree? This is because we loosen the soil around the base to cut the roots to lift out the walnut tree with its stump. Often wood with the most sought-after grain, which is notably used in the creation of rifle stocks, is found in the stump. Then the trunk is collected by our forestry truck for transportation to our sawmill. The very best quality trunks with perfect wood, beautiful grain and which are long and of a large diameter are set aside either be sawed to make boards of the highest quality for export, or are cut into slices for making veneers. Walnut wood is very heterogeneous in dimensions and quality. 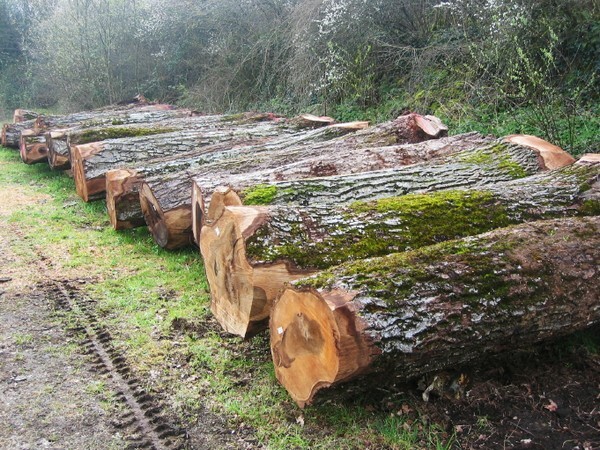 The trunks of ordinary quality (short and twisted) and the largest branches, are used for cutting to order. Les grumes de bonne qualité, droites, longues et avec assez de diamètre seront sciées en plots reconstituées de diverses épaisseurs. The good quality trunks which are straight and long with sufficient diameter are sawed into billets for boards of differing thicknesses. The best quality trunks, with perfect wood, beautiful grain and sufficient length and a substantial diametre, are set aside to make either the highest quality planks for export, or to be sawed for veneer.